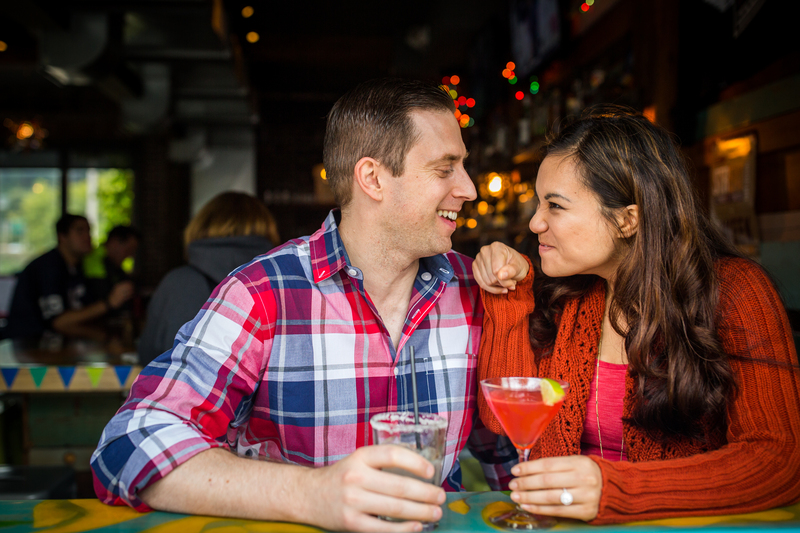 Manayunk is worth the trek. Full disclosure: we’re a little biased when it comes to talking up our neighborhood. 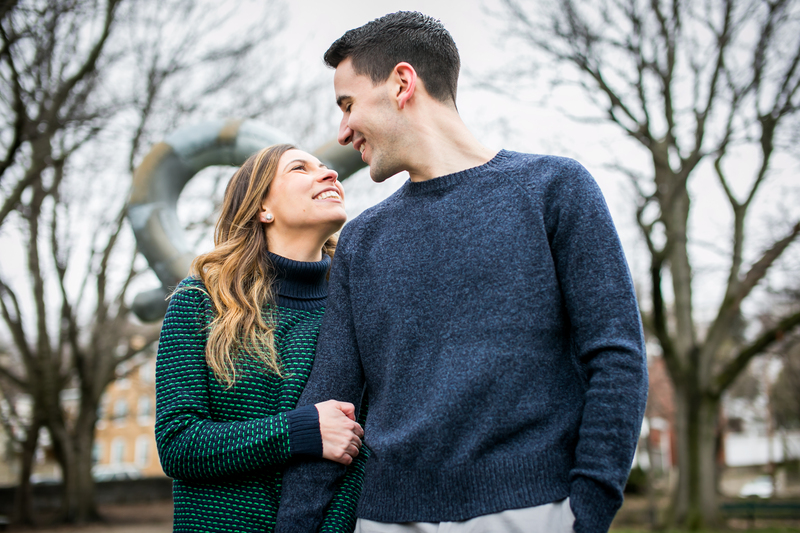 We think the combination of bridges, tow path, trees, architecture and all the secret spots make it one of the best places to explore and take stunning engagement portraits. In case you haven’t had the chance to fall in love with “MYNK” yet, here are your reasons to come visit our stomping grounds for your engagement shoot. If you go for a walk on the Schuylkill River Trail, you can also find mosaic stoops by Diane Pieri. 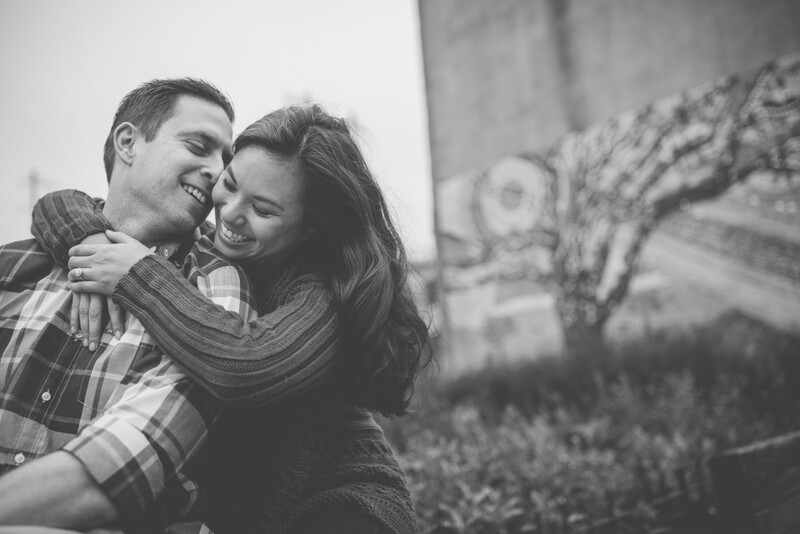 These make for adorable seated portraits with backdrops of vine covered walls, or even a couple of fun detail shots. Stoops are signature parts of the Philadelphia landscape, and Pieri takes the concept to a new level by placing these colorful versions in a surprising setting. Philadelphia is a city of murals, and Manayunk has its own fair share, especially along the Towpath. The water themed murals perfectly complement the canal and make the entire setting pop just a little bit more for photos. Artists Paul Santoleri and Beth Clevenstine bring elements of nature to life in the spirit of Manayunk with black and white wonder under the Green Lane bridge, and “Water Under the Bridge” painted on steps at Fountain and Umbria streets. The tiny, and sometimes windy, streets in Manayunk fuse classic Philadelphia row homes with Italian flair. 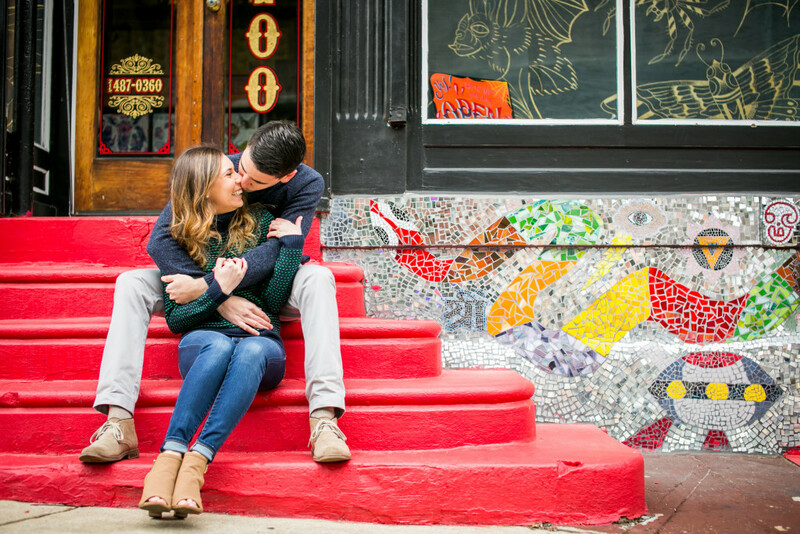 Although there won’t always be a trattoria around the corner, there are adorable streets that will provide a quaint background for your urban chic engagement photos. Part of Manayunk’s charm is seeing how this neighborhood is connected to the rest of Philly and beyond. The Manayunk Bridge Trail is a gorgeous walk above the river to rise above the neighborhood, and get a peek at Center City in the distance. 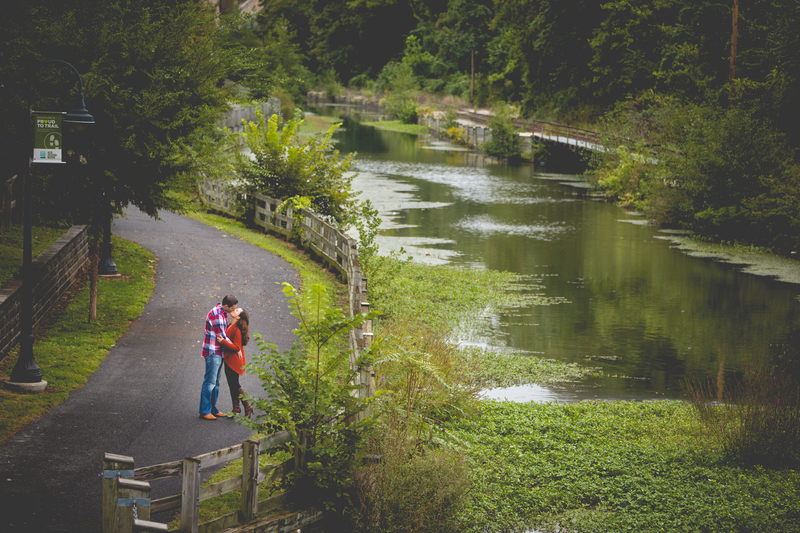 You can make the bridge the focus of your shoot, or bring your bikes and go for a ride along the Cynwyd Heritage Trail on the other side of the river. Lastly, if you are true Philadelphians, you know the love of pretzels runs deep in this city. (It isn’t a food, it’s a lifestyle). Luckily, Manayunk has the ultimate homage to perfectly shaped and salted baked dough with Pretzel Park. In addition to the pretzel statue, there is an adorable dog run and some lovely benches so you can take a seat and really enjoy the park. (Preferably with a pretzel). Linda & Ryan: Joe G.
Adrianna & Steve: Joe G.
Ryan and Linda go for a walk after getting engaged on a gorgeous October afternoon. Ryan and Linda conclude their shoot with cocktails at Taqueria Feliz on Main St.
Adrianna and Steve stop for a kiss by a set of stairs hiding by a wall of ivy. 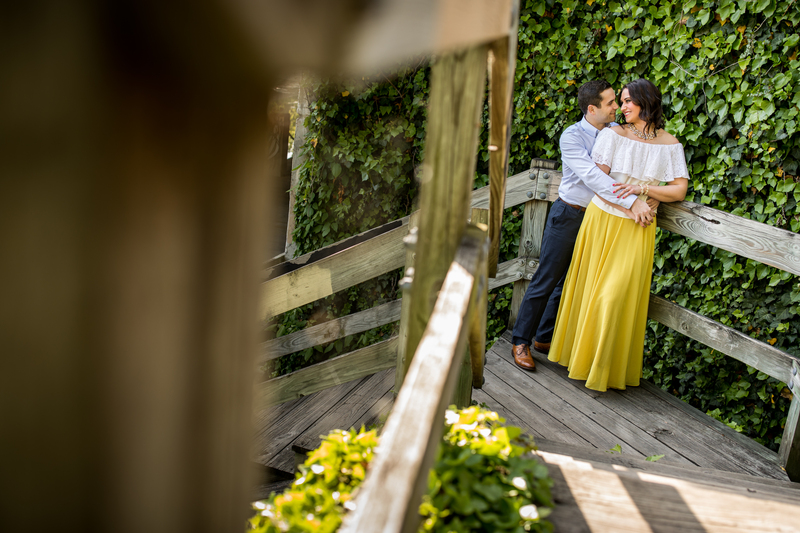 Adrianna and Steve under the Manayunk Bridge. Briana and Adam at Pretzel Park. Briana and Adam at Cresson St. Tattoo. 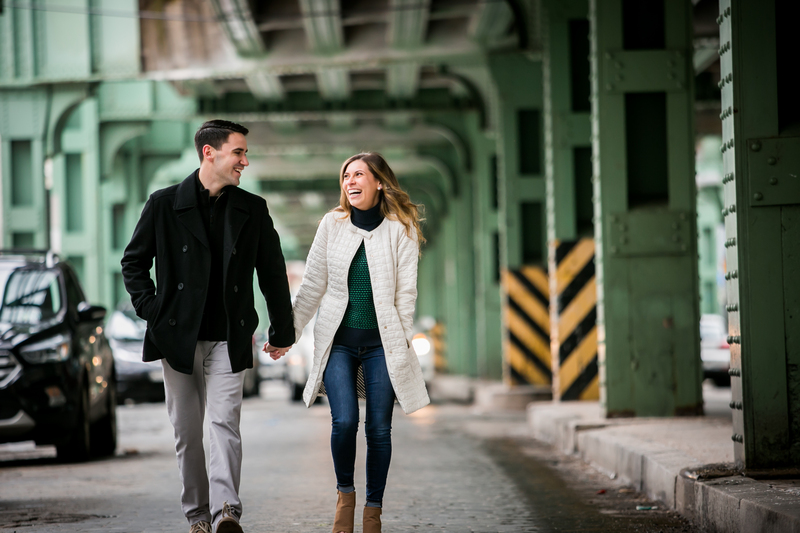 Briana and Adam walking under the train tracks for the Manayunk Norristown Line.